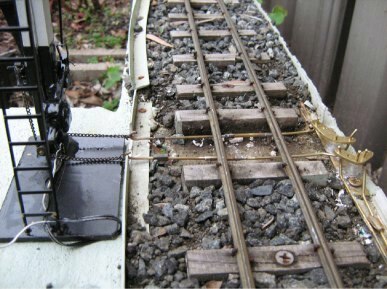 The following article by David Moffat extends his first article describing his 32mm narrow gauge outdoor layout and includes his successful application of a second small MODRATEC Lever Frame in this open-air setting. © The content of this article copyright 2011 David Moffat. Send email for David Moffat via MODRATEC. I mentioned in my first article that there was provision to add a second lever frame to control the points leading to the main line from the yard on the HJLR. This project was commenced during September 2008 with the design of the interlocking required to control the related movements from the yard to and from the main line. The final design was then sent to MODRATEC with an order for the related six lever frame. The frame was constructed and placed next to the existing frame. This frame was setup to control, first the points leading from the main line by lever no 3. 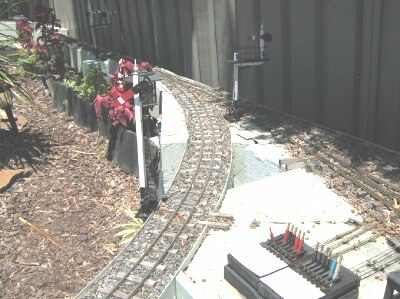 Secondly the points leading from the yard platform track to the run-around loop, these to be controlled by lever no 4. Both these levers were painted black, (denoting point control levers.) The remaining 4 levers were then painted red to denote signal control levers. These levers were setup as no 1, to control the home signal on the main line to protect the main line points for trains running in an anti-clockwise direction. No 2 lever to control the signal to allow movements from the HJLR yard to the main line from either the platform track or the run-around track. No 5 lever controls the signal controlling movements from the main line to the HJLR yard platform track or run-around track. No 6 lever controls the signal that allows movement of trains on the main line running in a clockwise direction. The rodding control methods used are the same as for the original frame setup: 1/16th brass rod and 1/8th square brass tube for the guides. The guides were setup in multiples as required to control the rodding. The signals are controlled by using rodding as far as the base of the signals and then chain connected to the counter weights as per the prototypes. 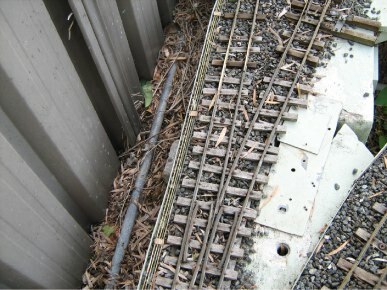 A new metal cover was constructed to cover the lever frames when not in use from the weather. 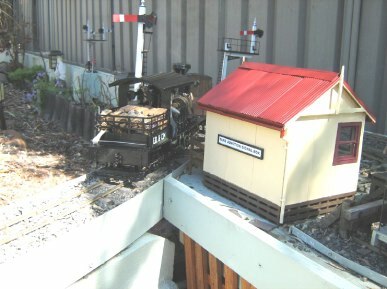 A signal box has been constructed to cover the frames when in operating mode. 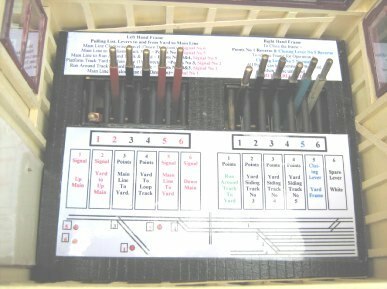 The floor of the signal box has been setup with both a diagram of the yard and a pulling list to allow visiting operators to work the frame as required. The roof of the signal box lifts off to allow access to the frames as required. In summary I find that these lever frames are ideal for operating the points and signals in an outdoor setting as they scale out to a 4'6" high lever and due to their brass construction withstand the elements very well. The use of brass for all of the fittings related to this has also proven to be very successful.